In Jean-Paul's private museum, lifting a machine gun like Choctaw Code Talkers Sgt. Otis Leader would have used. "Hurry up, this thing is heavy!" The first full day on our own consisted of meeting our wonderful guide of the next three days, Roger Cook — writer, historian, translator, and tour guide extraordinaire. Roger Cook at the Pennsylvania monument. Photo by Tiajuana Cochnauer. We met up with him in the Meuse-Argonne American Cemetery, where I took a little fall. Trying to get this shot, I stepped off a step I didn’t know was a step and sat down hard but gracefully (I think). Stiffness in my ankle and wrist concern me for part of the day, but then I was fine. Praise God! 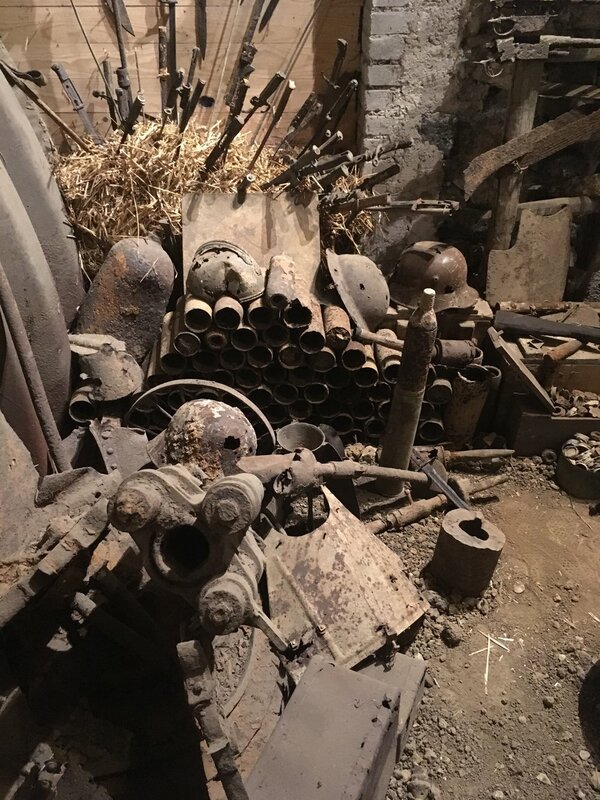 Nothing like what the soldiers faced in 1918. 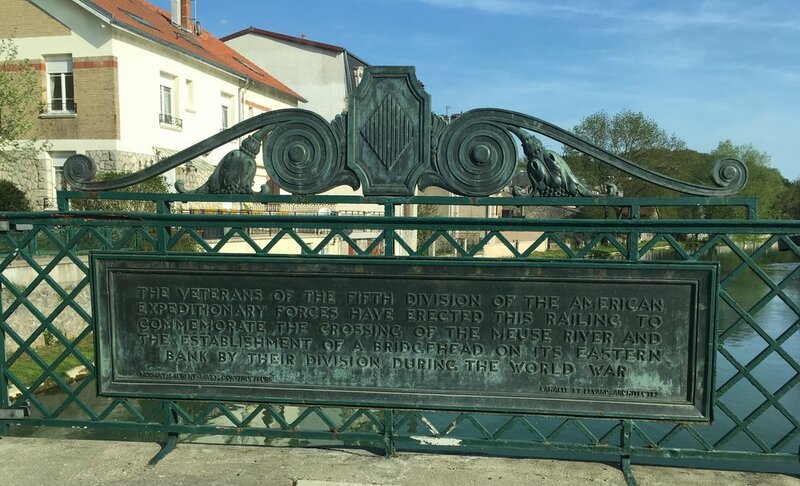 After meeting and having a great discussion with the superintendent, American Bruce Mallon, at the cemetery, we headed into Romagne, where Roger left us in the capable hands of a Dutch-Frenchman, Jean-Paul de Vries. I won’t go into detail about how extraordinary Jean-Paul and his museum are. Visit his website and enjoy these snapshots to learn more. 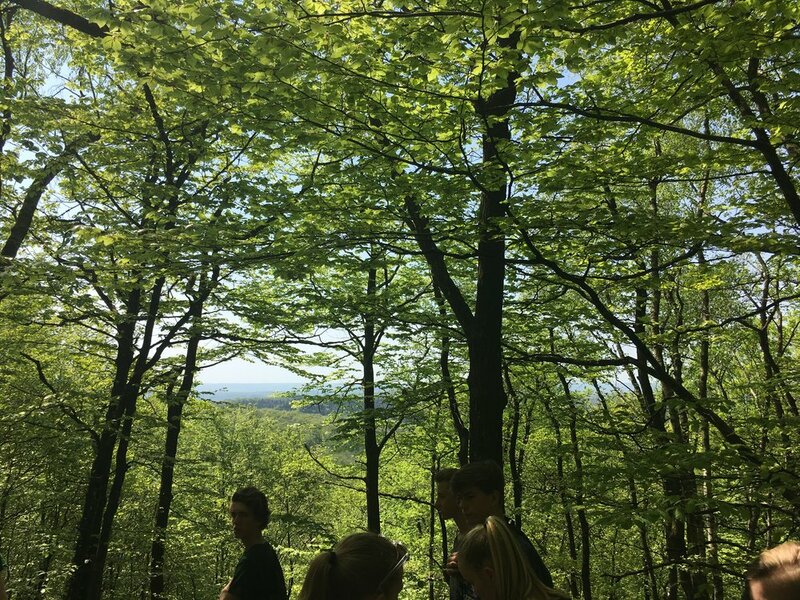 Jean-Paul invited us into his busy day by having us join a group of Dutch students on a hike up a Roman-built road and into the woods to see trenches, shell holes, and a wooded hillside the Americans took in 1918. He had the students charge up the hill to get a taste of what the Americans had to do, only in 1918, they carried a heavy pack and rifle with artillery and machine gun fire taking out their best friend next to them. We took a shortcut with the Dutch teachers, and watched the students charge up the hill. We stood where the Germans stood, always in the strategic place it seems. The Germans respected the cocky, determined Americans once they fought against them. The Americans respected the German’s fighting abilities, too. Dutch students have come to Jean-Paul’s museum for years. The teachers in this group came when they were in school, and showed us the newspaper clippings plastered on his café wall as proof. 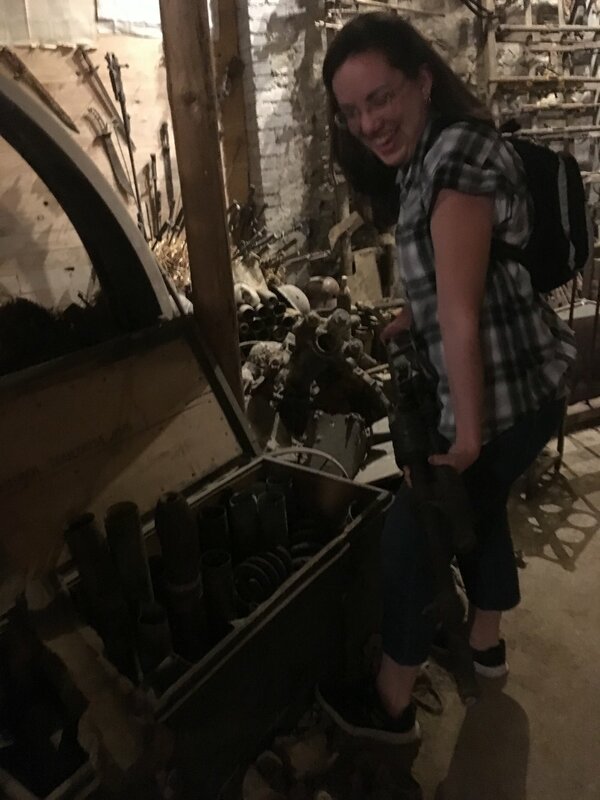 We ate lunch at the café and browsed the small selection of WWI artifacts Jean-Paul had for sale. 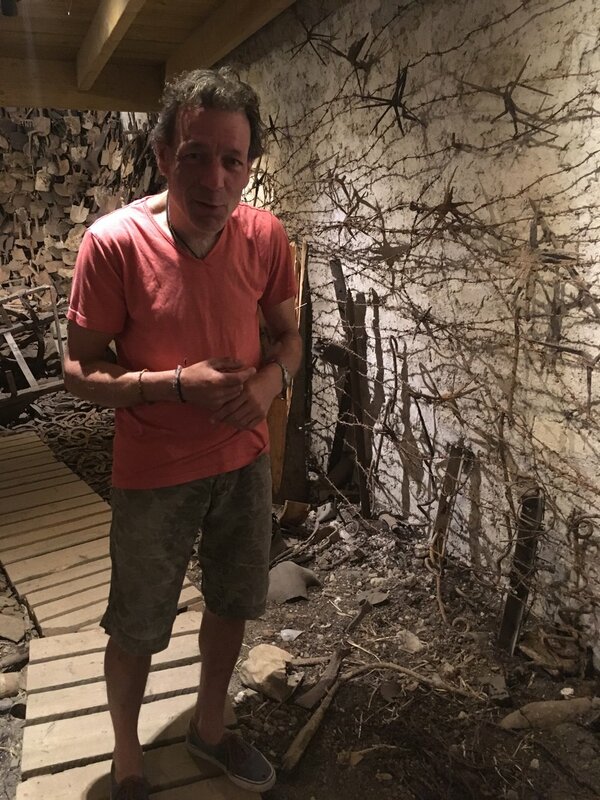 Much of what he’s found over the years is used in his museum. 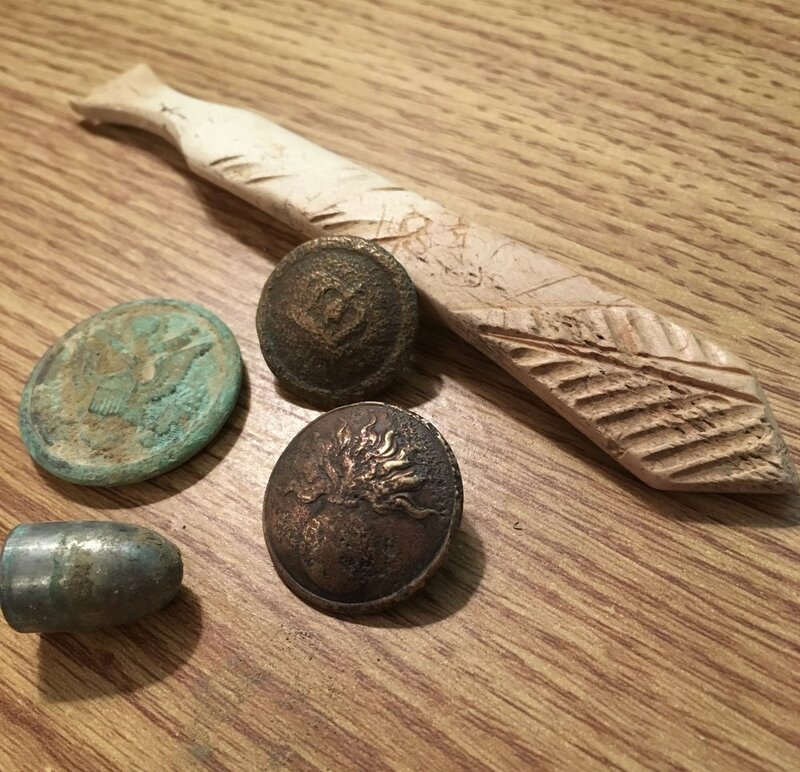 I bought uniform buttons — French, American, and German. After paying for my goods, out of the blue, Jean-Paul asked if I'd been in the military. That was a first. "You keep saying 'yes sir, no sir,' so I thought maybe you'd been in the military." "Oh, no, sir, that's just how I was raised!" He'd never heard someone non-military with those manners, I reckon. With the Dutch folks and a German bunker. Photo byJean-Paul de Vries. In Part 4, I'll take you for a 234 stair climb to the top of the Montfaucon American Monument and a magnificent view after we reconnected with Roger later that day. Read Part 4. Meanwhile, I've been tossing around ideas for some flash fictions based on WWI history I discovered over there. What do you think? Drop a comment and let me know! If something in this series so far has really piqued your interest, mention it and I'll see what I can work up. Note: You can see more photos and the live videos from France on my author Facebook page here.